There are a number of factors that can lead to valve chatter, one of which is the incorrect installation of a control valve. The chatter that occurs with the incorrect orientation of a pneumatic spring return actuated valve, is the equalization of the two forces between the process flow and the return spring pressure. This causes the valve plug to bounce up and down in the valve body. 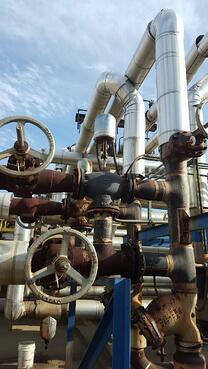 When diagnosing the causes of valve chatter, very few operators consider checking the installation of the valve. Whether initially installing or replacing control valves, operators should check that the correct installation of the valve has been determined prior to installation, relative to the position and instrumentation diagrams (P&ID’s) provided. Pre-analysis of the P&ID’S during valve installation is a preventative measure that can help limit the downtime costs needed to fix this problem. One of our clients, a natural gas infrastructure and processing company, recently installed a Baelz two-way control valve on their thermal fluid heating system. Shortly thereafter, they contacted us to report that the valve they installed was chattering. By process of elimination, our team concluded that the valve was not installed in the correct position. We recommended the customer remove and reinstall the valve. They decided that the recommendation was not a viable option for them at that time because it meant that they would have to shut down their process to drain the piping system that was connected to the valve. They were not prepared to incur the costs associated with the shut-down. Alternatively, they asked for a band-aid, a temporary fix that could hold them over until they were ready to reinstall the component. Therefore, Baelz supplied the customer with a stronger actuator that contained more springs to manage the resistance of the flow. Although the fix was an economical solution for the customer at that time, it is a temporary solution. Eventually, they will have to address the problem with the recommended solution if they expect their operations to remain stable over time. When that time arrives the customer will have to take the necessary steps to cool and drain their system. Then the operator will need to either flip or reorient the valve. Before reorientating or replacing the valve, we recommend that operators reconfirm the port positioning provided in the P&ID’s. When the valve installation is complete, the system can then be refilled and reheated. The downtime of the production process for this type of correction can be as much as a week or more. In many cases, the solution is not always as simple as it may seem, it is important to contact your valve specialist at the first sign of chatter. Baelz North America offers experienced technical assistance to help customers identify and solve problems that may develop. For more information on avoiding valve chatter, download the guide "Avoid Valve Chatter Due to Improper Valve Orientation".